If you live in Blue Bell, Pennsylvania, you know how much the weather can vary throughout the year — that’s why sunrooms installed by SRA Home Products are a great investment. Thanks to a thermal wall and roofing system, as well as an option allowing you to open up the windows to reveal high-quality screens, you can enjoy our sunrooms no matter the weather. Our sunrooms are so strong, they are even rated to withstand hurricanes. TEMO constructs its outdoor living products, including its sunrooms, using extruded aluminum, which is a stronger and more durable alternative to comparable products such as roll-formed aluminum, vinyl, and wood. TEMO led the sunroom industry by creating the first insulated wall and roof system. TEMO’s sunrooms are certified by national agencies, including the International Conference of Building Officials and the National Evaluation Service. TEMO has completed projects for more than 100,000 customers across the nation. The Better Business Bureau has awarded TEMO an A rating. TEMO offers a limited lifetime transferable warranty, meaning that if you ever choose to sell your home, you can transfer the warranty to the new buyer. Please contact us if you live in Blue Bell, PA and are interested in having one of our beautiful sunrooms installed. 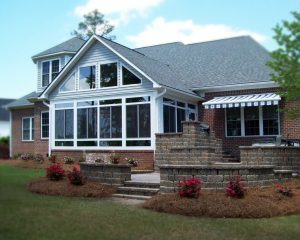 We would love to have the chance to help you customize a sunroom that’s perfect for your needs.